I swear, every time I wear these shoes, someone cracks a Greek mythology joke. But do you know what? I don’t care. My shoes have polka dots and wings on them, and they are awesome. I saw the shoes online in solid white and thought they were pretty as could be, but way out of my price range- Anne Hathaway wore them for an Oscars rehearsal, apparently. And then I happened upon them in Ross and snatched them up in a second. Thank goodness I have tiny tiny feet- these are size 5 1/2! 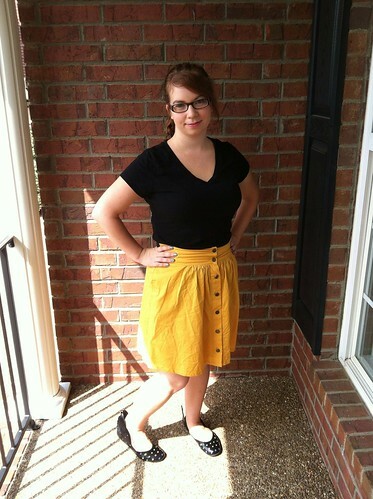 This skirt was one of my purchases in Modcloth’s last 70% off sale. It has elastic in the back, and it’s super comfy. And a good teacher-y length! They have the sale twice a year and they held it this week- so I’ve got two dresses, three pairs of leggings, and a pair of shoes coming my way. It’s a little hard to see in this picture, but I matched my lip color to the pink polka dots on my shoes. I was so excited. And then I stopped caring about things and put my hair in a ponytail. « Wednesday Writing: Progress? What progress?